Home / Isralicious / Here Comes WordCamp Jerusalem 2013: Feb. 20th! 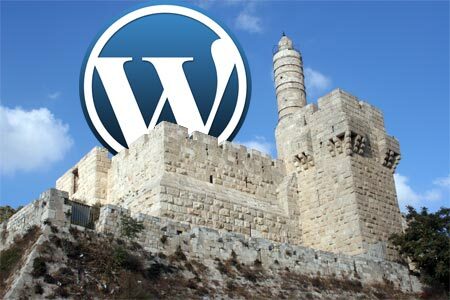 Here Comes WordCamp Jerusalem 2013: Feb. 20th! How many WordPress developers does it take to screw in a lightbulb? None! There’s a plugin for that. Conferences are the highlight of my year. They’re fun, if somewhat awkward. The sense of excitement and belonging, the starbursts of hashtags and related social activity. And the social mentions. Let’s not forget the social mentions. In the never-ending quest for peer approval, I turn to Twitface. (Twitter + Facebook = Twitface. It’ll be a thing.) I loooves me some social mentions. And then the responses, with all of those thrilling notifications that pop up everyone. On the phone! On my computer! In the three different browsers I have open so that I’ll see my notifications in triplicate! I won’t pretend to be cool… I wait for those notifications. I do. And then I bask in them. Oh. And the sessions aren’t bad either. I kid! The sessions are entertaining as all get-out. Even if the speakers don’t present well (and they do), there’s always the vehement, intensive session of criticism after the fact. Vitriolic are the comments, great is the enjoyment had by all. Humans are social creatures. And there’s nothing more socialable (is that a word?) than 300+ people crammed into a conference hall talking about mutual topics of interest for 8+ hours. Not sold yet? Fine, we’ll throw in a free WordPress pin. For reals. In all seriousness, if you’re at all interested in honing your WordPress skill set and connecting with the Israeli WordPress community, WordCamp is an event worth attending. WordCamp Jerusalem is a full-day event packed with back-to-back sessions by the crÃ¨me de la crÃ¨me of Israeli WordPress talent. It is the sole and only event in Israel that brings together the top WordPress developers and professionals from all over the country. It’s also a prime networking opportunity. If you’re looking for a top-notch WordPress developer, or if you want to partner with someone in the field, you’re virtually guaranteed to find someone at WordCamp Jerusalem. The event is organized by illuminea, and it will take place on February 20th, which means that the clock is ticking. And we were serious about the free pins.